Only one of the participants, Al Di Meola, could truly be called world-renowned, but several of the others—the Dutchman Stochelo Rosenberg was particularly mind-blowing—deserve to be. Helming the entire affair was Stephane Wrembel, a master of the genre best known for his contributions to two Woody Allen films: “Big Brother,” heard in Vicky Cristina Barcelona, and “Bistro Fada,” the main theme of Midnight in Paris. Born in France in 1974 and educated at Berklee, Stephane Wrembel has emerged in New York over the past decade-plus as a tireless advocate of Gypsy jazz. He has published a book, Getting Into Gypsy Jazz Guitar (Mel Bay), toured the Django a Gogo Festival nationally and maintained a long-running weekly residency at the Brooklyn club Barbès. This year, just prior to the Carnegie bash, Wrembel also coordinated a weeklong music camp in his New Jersey hometown, where Di Meola, Rosenberg and several others taught and performed. 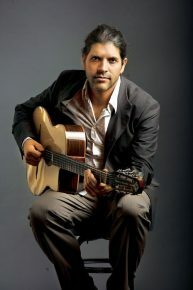 Wrembel decided early in his career that Django’s music would serve as a springboard for expanding Gypsy jazz, and nearly all of his recordings have featured Wrembel’s original music. But in April he released two new albums, The Django Experiment I and The Django Experiment II (on his own Water Is Life label), that mix his own tunes and Reinhardt classics seamlessly. JazzTimes: What is the concept behind the Django a Gogo festival?? Stephane Wrembel: Every year I bring over guests from Europe and the U.S., a group of people that don’t usually play together. The idea is to have a couple of masters of the genre and a couple of masters who play something else and can express themselves on Django’s songs. The idea is to have someone like Al Di Meola coming into our world. Then my half-Django, half-New York vibe. It’s a very special meeting of guitars. How did you choose the musicians for the festival? I’m a musician, so I think of the music; I don’t think like a promoter. It’s not good for my bank account, but I think of art first. I had a vision and I really wanted to bring it to Carnegie Hall, because it’s the greatest hall in the world. [This particular show] has never been done before, and it’s never gonna be done again. Why do you think Django’s music still resonates? It’s irrational. But I can tell you this: You’ve never had another musician in history that has festivals in his name, people grouped together playing his music all over the world, going to camps all over the world. He had something different. When people hear Django, something clicks in their minds and they are haunted. They have to play it. They get the guitar, they take the lessons. It’s a crazy thing. The man is a genre unto himself. You were classically trained on piano. Why did you switch to guitar? I started guitar when I was 16 and I really wanted to play Pink Floyd. Did you ever play in a rock band? Oh, yeah! My band is a rock band [laughs]. It’s disguised as jazz but it’s really a rock band. I always loved the ’70s rock, and it is in my playing for sure. Then when I was 19, I decided to become a professional musician and to extend my horizons. I grew up in Fontainebleau, which is the home of Django’s music; Django was based there. Being from there I had the thought in my mind that I need to explore jazz, and jazz guitar to me was Django. So I went to the Django festivals, I met the Gypsys and it blew my mind. I said, “I’ve got to do this.” So I spent the next six or seven years with the Gypsys to learn their craft, in the camps, in the traditional way. Then I went to Berklee and expanded my horizons even more because I was on a quest to learn more things. So I hung out with African players and Indian players and extended my vocabulary. Then I moved to New York when I was 29 and started playing and playing. Was it difficult to learn how to play in the gypsy-jazz style? It’s different chords, different everything. But if you don’t spend time with the Gypsies it’s hard to get a good grip on it. Of course, technically it’s really hard, but you can always learn the technique and still not sound like that. In Django’s world, the environment is crucial. You can take a guy from Virginia who plays bluegrass and then you can take a guy from France who’s listened to some records and has never been to the U.S., and it’s not going to sound the same. But if you come to the U.S. and go to the festivals and hang with the guys for a few weeks or months, then you start to really get it. You need to be soaked in the environment as well as the technical thing. How did you get started working with Woody Allen? They contacted me and took one of my recordings for the movie [Vicky Cristina Barcelona], and then they called me a couple of years later and said, “We need someone to compose a Parisian French waltz that captures the soul of Paris.” So I composed that waltz, “Bistro Fada,” and sent it to them and they loved it right away. I was also in [another Allen film] Magic in the Moonlight, but the scene ended up being cut. But he’s a great guy and it was an amazing experience. So when are we going to see a Pink Foyd gypsy-jazz covers album from you? Pink Floyd is my favorite band, but they did their thing so well that I’d never want to touch it. Read Aidan Levy’s review of Stephane Wrembel’s album Oasis.